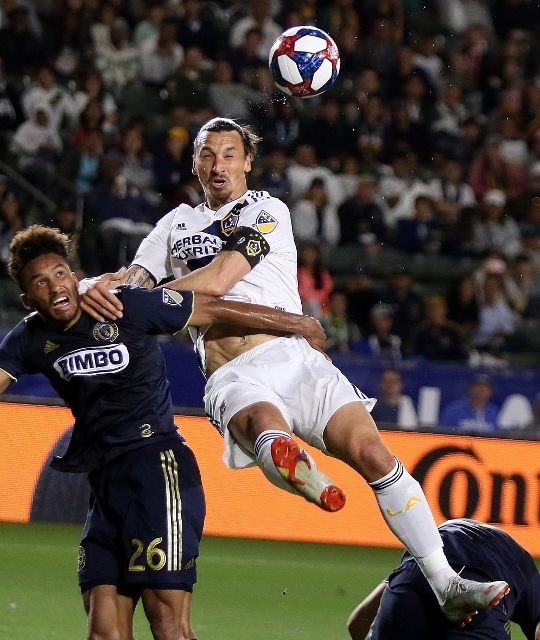 (Carson) – Zlatan Ibrahimovic, who else?, scored twice in the first half and the defense did the rest as the Galaxy shut out Philadelphia 2-0 Saturday night before 24,053 at Dignity Health Sports Park. Ibrahimovic got LA started with a header past Philadelphia goalkeeper Andre Blake in the 27th minute. Ibrahimovic took a nicely executed cross from Jorgen Skjelvik, climbed up the back of a Union defender and headed it home for his fifth goal of the season. The Galaxy had a couple of earlier chances before they got their first. 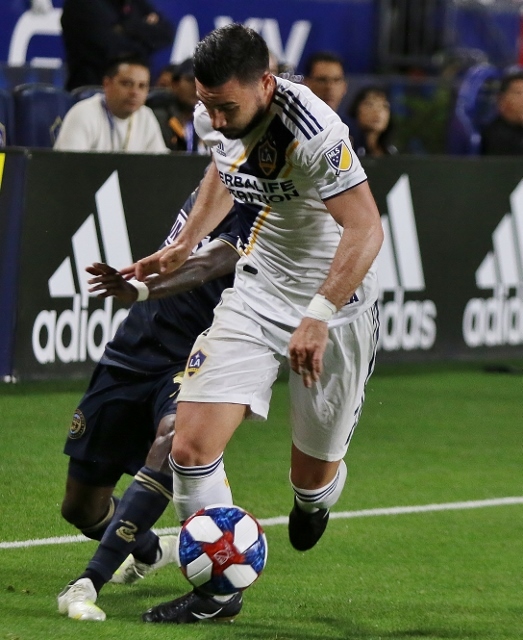 In the 14th minute Romain Alessandrini was knocked down in the box but there was no call. In the 22nd minute Uriel Antuna’s shot had some momentum but was right at Blake who hauled it in. In the 25th Rolf Feltscher’s corner kick was in front of the box but didn’t reach Ibrahimovic who was hanging out by the net. Six minutes later Ibrahimovic picked up his sixth of the year when he blasted a free kick by Blake. He was leveled in the box and after a review by the officials it was ruled a penalty kick and Ibrahimovic took full advantage. Ibrahimovic went down in the 41st minute after an awkward fall on a pass to Antuna but he quickly recovered. Seven minutes of additional time were added in the first half. The Galaxy threatened in front of the net but an apparent goal by Joe Corona was waived off after a foul on Ibrahimovic and the Galaxy took a 2-0 lead into the break. The Union came out firing in the second half as they tried to get back in the game. A goal was disallowed due to an offside penalty and in the 54th minute with Philadelphia buzzing around the net a shot by Alejandro Bedoya hit the post just to the left of Galaxy goalkeeper David Bingham. The Galaxy survived the barrage and settled into the second half holding off Philadelphia the rest of the way. In the 64th minute Feltscher left with a groin injury and was replaced by 17 year old Julian Araujo. In the 77th minute Philadelphia’s Austin Trusty was hit with a red card for pulling down Sebastian Lletget. The Union payed the rest of the way with ten men. Four minutes of additional time added but the Union couldn’t break through and the Galaxy had their shutout. With the victory the Galaxy improved to 6-1 on the season. They were third in the West coming in. The Union fell to 3-3-1. 2 Comments to "Galaxy Shuts Down the Union"
@Big Cat. Dumb. Good effort though. Eldrick Tont Woods just completed his comeback, winning The Masters today. He plans to celebrate with extra strokes on the nineteenth.